Mikkel Dankner aka Soulscience is a DJ & producer from Florida who already lent his talents to Yoruba Records when he remixed the hit 'Change For Me' for its original release in 2001. Now completed by gorgeous and moving vocals by Dennis Baker the two are responsible for the newest release on Deeper Shades Recordings. Hypnotize You will do just that, taking you under its spell whether you like the original mix reminiscent of current afrotech productions or one of the strong and outstanding remixes in the first part of this package. Atjazz from the UK took the song to a different level using his signature drum programming, a bassline that should never stop as well as the sweetest chord progressions and sound creations. A simply genius remix! DKMA's approach is a more techy one true to his recent releases on Plastic City. His mix of dry in your face drums with low subs & chords that fill just the right spaces is very peak hour friendly but can also addthe perfect amount of vocals on any afterhours party. 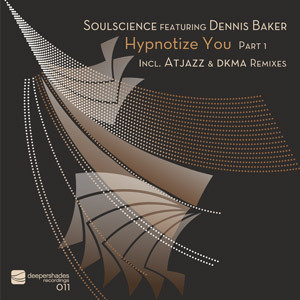 The final featured remix in this Part 1 of Hypnotize You comes from Dennis Baker's production outlet SoulXpreS. He truly brings out the soulfulness of his own vocals with a rolling bassline, smartly placed pads and a steady hand on the piano to create an emotional piece. Feeling this record for sure!! All the mixes are well done, but i am favoring the Atjazz remixes!! All and all a great record. so at the end thsi mix is the one i will play and support ! the SoulXPres Mix is the one I’ll play. Thought this mix had the best direction for the lush vocal. So full support on the SoulXPres mix. Mr Behrenroth’s Deepershades delivering a very fine piece of soulful music. The DKMA mix and original are the ones for me and get my support. another banger from Atjazz, this goes straight into the rotation! feeling this release a lot, all the mixes are very cool, Atjazz coming out tops, but also feeling the DKMA mix too, quality...will support on radio ASAP! Love the new release. It's rare to hear such a good vocal these days. I'll be playing both the original and Atjazz remix. Atjazz does it again! But I'm also feeling the DKMA remix as well. Another solid release from Deeper Shades.